Slow Cooker Mediterranean Eggplant is a super easy vegetarian meal. These veggies come together in minutes and you have a fantastic slow cooker meal. A blend of eggplant, zucchini, and tomatoes is so full of flavor! The veggies release their own juices which are delicious! A great slow cooker eggplant meal on its own or with some pita bread or over rice, orzo, quinoa, or cauliflower rice! I love eggplant and if I can prepare it in a slow cooker without a lot of fuss, woohoo! This brings Slow Cooker Mediterranean Eggplant! 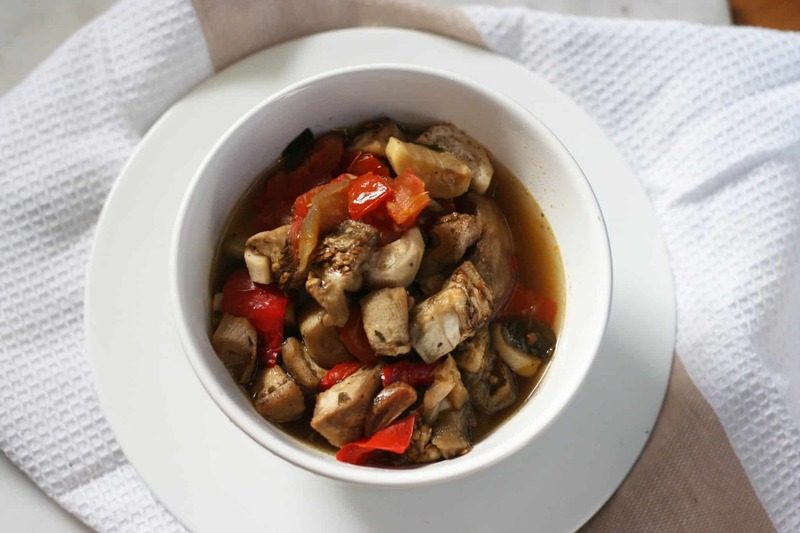 This is a wonderful blend of hearty vegetables that slowly cook to blend all the delicious flavors. When I am making this amazing eggplant recipe in the slow cooker, the amazing aroma of Mediterranean flavors fills my house. I am a huge slow cooker recipe fan! Especially as the Holidays approach because eating well and without a lot of fuss is super important to me and my family. We need to eat easy healthy meals. Plus I need the food to be easy to serve. Slow Cooker Baked Beans: A great side dish for an easy chicken sandwich or burger. Slow-Cooker Sneaky Tofu Lasagna!So sneaky they have no clue and so good! I have made this Slow Cooker Mediterranean Eggplant for my family regularly now. 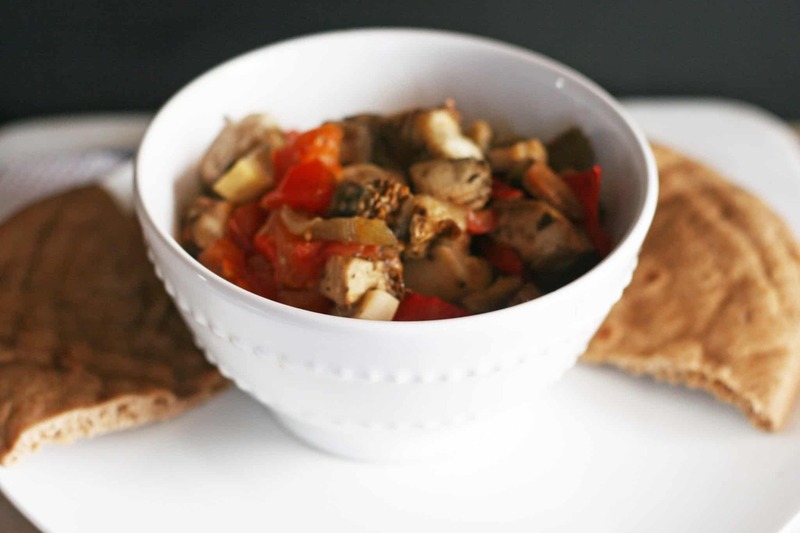 My favorite way to serve this tasty eggplant slow cooker meal is with a slice of gluten-free or whole wheat pita bread. The vegetables release a delicious amount of liquid that produces an amazing flavor. The pita bread picks up the juices from the eggplant and tomatoes and it is just delicious. This is another great dish to use those summer garden veggies too! Adding in feta cheese to complete the dish is the icing on the cake! The dish is heavenly! Before using eggplant in eggplant recipes, Do you need to salt the eggplant? I talk a lot about the benefits of eggplant and the prep process in Easy Grilled Eggplant Caprese Salad. Soak the eggplant to remove any bitterness from the eggplant. I let it soak about 20 minutes. Then rinse off the excess salt. When making Meditteranean eggplant or any recipes with eggplant, is it necessary to peel the skin? The skin of the eggplant is completely edible. Depending on the recipe, I decide whether or not to remove the skin. It is more of a personal preference. I try to leave the skin on for many recipes because it is a great source of antioxidants. Keep the vegetable cuts around the same size for even cooking. Try to avoid lifting the lid during cooking. This brings down the temperature and can mess with cooking times. I always add extra herbs to slow cooker recipes, enhances flavors. Do not overcrowd the slow-cooker, the food won’t correctly cook. Therefore, buy a slow cooker that will suit your family size or cooking needs. Slow Cooker: choose a slow cooker for your families size and needs. Wooden Cutting Board: Every kitchen should have a few cutting boards. Good Kitchen Knives: Be good to yourself and invest in a good set of knives. Add olive oil to the slow cooker. Peel eggplant and dice into 1-inch cubes, add to slow cooker. Chop bell peppers, onion, tomatoes, zucchini, and garlic. Add basil, oregano, salt, and pepper. Coat the veggies well with the olive oil. Serve with feta cheese. Feel free to serve with pita bread, orzo, brown rice, or cauliflower rice. Disclaimer: I was provided with 365 Slow Cooker Suppers by Stephanie O’Dea to review by Houghton Mifflin Harcourt Publishing Company. I was not compensated for my review. All opinions are my own and are not influenced by the sponsor of these books! When you make Slow Cooker Mediterranean Eggplant, take a pic and tag me on Instagram @everyday_eileen or #everydayeileen. We love seeing your recipes and I try to repost the pics. 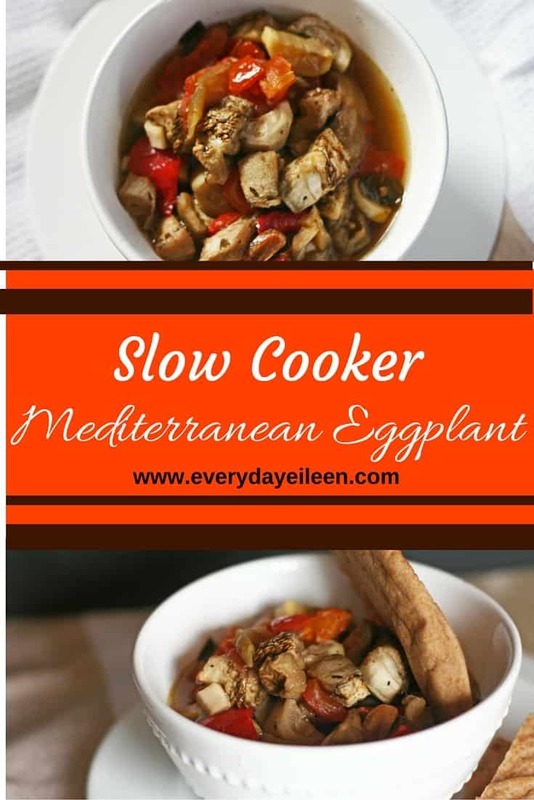 Are you loving Slow Cooker Mediterranean Eggplant, giving it a 5-star rating and any comments are super helpful for me and very much appreciated! An easy recipe to prepare in the slow cooker. 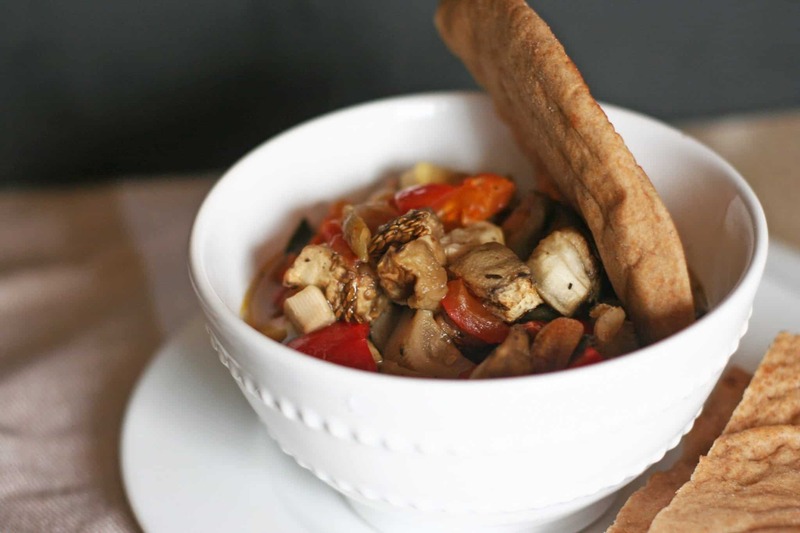 A delicious blend of Mediterranean flavors using eggplant, tomatoes, and zucchini! This is a great low-calorie recipe. I have also had this as a cocktail party as an appetizer with pita chips. To a 6 quart slow cooker, add olive oil. Add in the eggplant, bell pepper, tomato, zucchini, minced garlic, dried basil, salt, and pepper. Combine the ingredients well to be coated with the olive oil. Place lid on slow cooker and cook on low for 5 hours or high for 3 hours. I love to use whole wheat pita bread to serve alongside this tasty meal. This is a great make ahead meal. Tastes amazing second day. Keep well covered in the fridge for 3 days. The nutritional count if for the recipe, excluding pita bread, as the pita is optional. Thanks for sharing your recipe! It is one of the best eggplant dishes we’ve ever tried. I thank you for taking the time to let me know that you enjoyed this eggplant recipe Andy! I truly appreciate your kind comments! Oh OMG! Awesome and delicious recipe. I can’t control myself to taste this food. I love Eggplant and food images are very live. Thanks for sharing. Thank you Deb! this is a favorite of my family ! One of the best slow cooker meals I’ve ever had. A beautiful merriment of simple flavors. Served with a side of couscous. Thank you for sharing. JD, thank you so much for visiting my site! I am so happy you enjoyed the eggplant! It is a family favorite in my house too! I love serving this with couscous too! Thank you so much for taking the time to write such a lovely comment! Love like everyone else the vision of this recipe as my 5 hours in the slow cooker are up. Question is how soft are vegetables suppose to be or put in another way how can I tell if it is ready to serve? This is my first week using a slow cooker and I’m really new at cooking. Hi Wes, so glad you are loving the recipe. The veggies should be fork tender. Especially since you are new to slow cooking and I want you to keep using them, take out one of the pieces of veggies and give it a taste also. Let me know how if you have any questions. take a pic and post- I hope you enjoy! YUM! Cannot wait to give this recipe a go, and I’ll definitely be adding some feta. Looks delicious. Thanks for sharing! I love that you can just toss the eggplant into the slow cooker, no salting and squeezing and all that noise. This may become my new favorite eggplant recipe! Yeeess, a slow cooker is definitely one of the next kitchen tools I’m going to buy. This looks excellent and so easy to make!! I love Mediterranean flavours, this sounds divine! Eggplant is so delicious when it’s cooked like this. It has time to soak up the spices. Great recipe, thanks for sharing. I love using my slow cooker! It’s so perfect for busy moms like me. Great book!! And great recipe!! Oooooo this sounds so yummy!!!! I would of never thought of eggplant in a slow cooker! Swear you can make anything in those things! I’m not an eggplant lover but many people ask me how to cook it. I am glad to see this because I can share this recipe with them from now on. 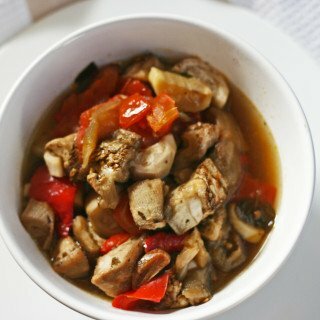 I know many appreciate easy slow cooker recipes! Thanks for sharing! This looks absolutely delicious. I am a huge fan of slow-cookers. I will be trying this one! That recipe looks delicious.Love using my slow cooker.It saves so much time. I am a slow cooker fanatic! This recipe looks good and simple, which are hallmarks of great slow cooking. I’ll give it a go! I like Eggplant myself. Thank you for the recipe and another option to enjoy Eggplant. I don’t have to fry them every time I want Eggplant now! So glad you have a new recipe to enjoy! This looks delicous!! 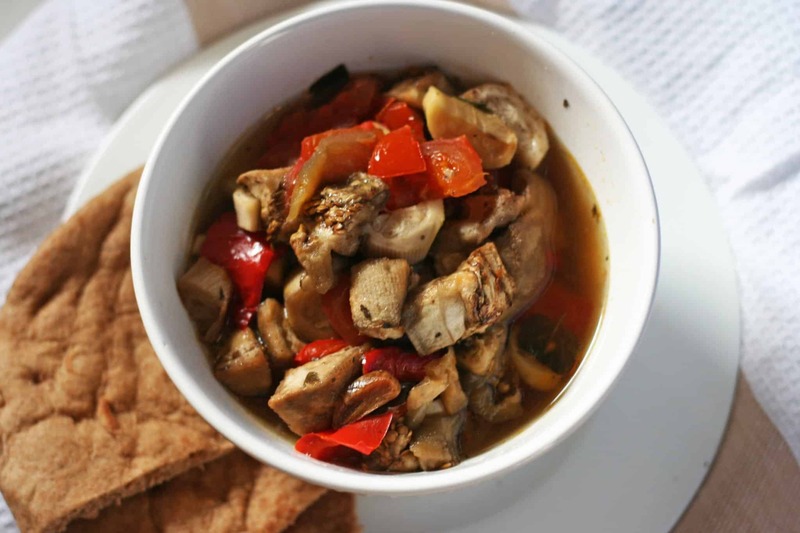 I have never cooked eggplant in a slow cooker before sounds like a great dinner!